Frames are almost complete, only side battens are not installed. 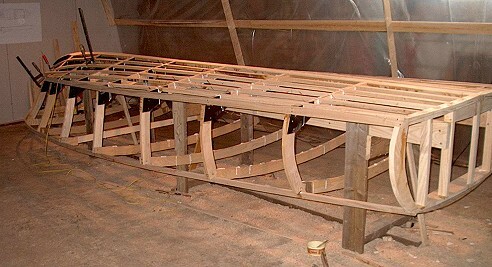 I have been working with my boatbuilding project about a year. Through this time I have received huge help and support from Mark Bronkalla. He helped me from choosing the right design to working tips and hints. Your plans are very complete and easy to understand, but I am a beginner in that field and felt much more confident with Mark's support. About 200 working hours so far, plus lots of research in the internet and books.